When we got the boys their tablets, we knew that our boys would love using them as gaming devices. At the same time, we knew it would be used for far more than just games. With the Kindle Reader, they boys can read books on their tablets. There are also plenty of educational apps that they can use to learn. What I didn’t expect, though, was for NHL to use his tablet to make music. A couple of years ago, NHL began playing the drums and bells (xylophone). He quickly displayed an aptitude for it. Not only did he pick up how to play quickly, but he demonstrated the ability to translate his skills to other instruments. Playing also is a point of pride to NHL. Once he gets over the initial fear of not being able to play a piece, NHL becomes very happy when he masters a song and can’t wait to show someone (other than me who stands by his side all the time). I began to wonder whether NHL would be able to compose his own music pieces. To this end, I immediately thought of his tablet. First of all, the boys have taken to the touch screen interface as if they had always been using it. Secondly, the tablet tends to be always on while our laptops need to boot up and are much bulkier. A quick search on the Google Play store turned up a few promising candidates. Music Composition was the first app I tried. I found the interface nice, if a bit clunky. The features, however seemed really nice. Not only could you position the notes to make a song, but you could have the song play as you composed it. 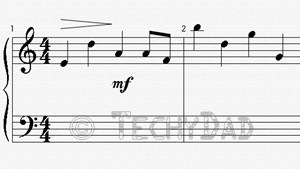 (Very handy to see if the note you just placed improves the flow of the song or hinders it.) In addition, your creation can be exported to an image that could be printed. In other words, your tablet creation can become sheet music. (Useful since I wouldn’t recommend positioning the tablet near bells mallets which keep swinging at keys.) Of course, the price was great: free. Ensemble Composer was the second app, I experimented with. I actually liked this one more. It seemed to have all of the features of Music Composition, but the interface was much slicker. The only drawback was that many major features, such as exporting to a sheet music image, were locked away unless you bought the Pro version for $12.99. Luckily, the musical creation can be saved in MusicXML format. I can then send that file to Google Drive, open it on my laptop within a free, open source program called MuseScore and export the song to PDF for printing. Right now, NHL is just occasionally playing with the apps. His song creations seem to be less music and more "throw every note in and see how it sounds." With some practice, though, it should be interesting to see what he can create. Have you or your children ever used a music creation app?